Every day or two, I head down to the lake, with my beloved pal, Jasper, a four-year-old retriever-poodle mix. And, with my camera. From November to the end of March, the entire beach is a leash-free area for dogs. It’s dog heaven. Some days, there are dozens of dogs. Sometimes, only a few. My pal loves it. He runs free, in wide-open space, and if the lake’s not iced up, he likes to wander into the water to check things out. Like I said, it’s dog-heaven! For me, well, I won’t be putting my toes in the water anytime soon, but the rest of it – I love. The wide open space, the lake which changes every day, the shoreline, the friendly conversations with other dog-owners, and the unexpected love you get from pups who come round to say hi! It’s all a bit of heaven for me, too. Today, my pal and I made our way to the lake around lunch time. Not too many at the beach. The sky was hanging low over the water but, gratefully, it was rain in those clouds, not snow. As usual, I took a number of images of the skyline. I love the simplicity of the horizon..where sky and water meet. Often, it’s its own unique shade of blue or grey. A thin line, running straight across the my viewfinder. Today, something new. Today, with spring hinting at its arrival, there were birds in the water. A few ducks, who showed up as flecks of white on the blue surface. Barely perceptible. One moment, having a coffee clutch it seemed, the next disappearing below the water’s surface, and then popping up some place further along. It was a delight to watch them. Like Jasper, it seemed they simply enjoyed being able to play in the water. By that point, it had been a nice, long walk. I decided it was time to head back; to start the long walk across the beach, to the car. We wandered along. Me, looking through my lens to see if there were any finals shots before calling it a day. Jasper chasing leaves blowing in the wind. And, then, we heard it. The call of the swans. They sounded their trumpets. I wasn’t sure if it was them. I turned back towards the lake, to see what it was. And, there they were. The two of them, in the flight. Soaring up from the water, and making an arc as they turned towards land, making their way to an unknown destination. In flight. The two of them. Elegant. Serene. Beautiful. It was not something I’ve ever photographed before. I”m not sure I’ve even seen it before. Not like this. Not so close. I don’t know what called them into flight. What inner prompt said, it’s time to go. Perhaps, a ritual of their own. What ever it was, I don’t think I’ll ever forget the sound and the sight of them. Beauty. Serenity. Elegance. In flight. Every ‘Third Thursday’ of the month, Brenda Gottsabend, over at How to Feather an Empty Nest, invites us to try something new. Press the button below, and check out what’s happening over there! How fabulous that you were there to see this, and then to catch in with your lens! What a beautiful moment! 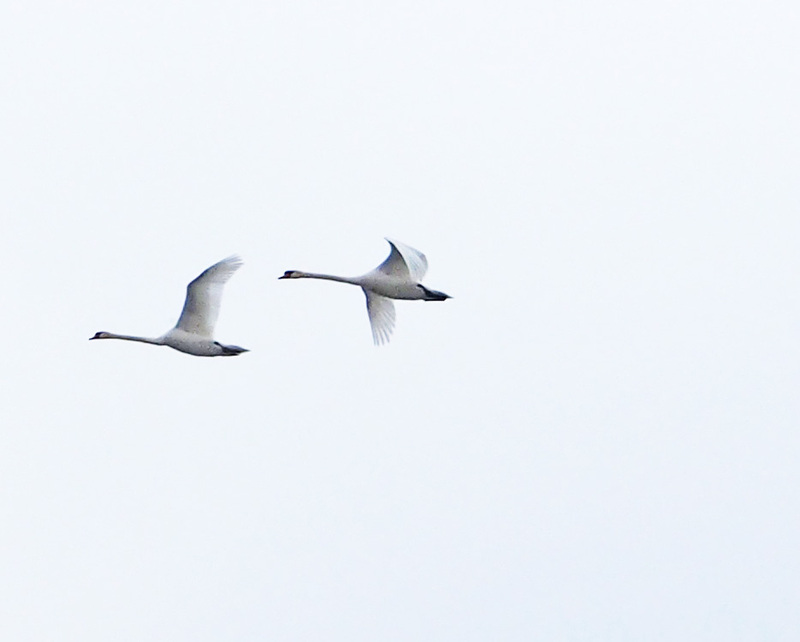 I have never seen swans in flight as far as I can recall. Such elegant creatures they are, and this photo really honors that. Wow, Juli! I love the amazing simplicity of this image – with the swans captured in mid-flight – and only them against the white of the sky – their necks out-stretched, wings flapping. An ode to the freedom of flight. Such grace, such beauty. And the simple beauty of your story – a daily walk, a dog, a camera. A lesson in what is waiting for us, if we are ready to accept its grace. It’s the simple miracles, is it not? Thank you SO much for sharing this with the Third Thursday Challenge – a visual treat of quiet power. Juli, your words make me feel like I was right there. This is truly so beautifully written, and what a perfect photograph this is. Wow…just wow! What a wonderful story to go with the beautiful image! I love those unique experiences that can stay planted in your memory. Aaaah – I feel the same as you about the swans. What a simply stunning image! !